Near 3 Golf Courses - Price Reduced! 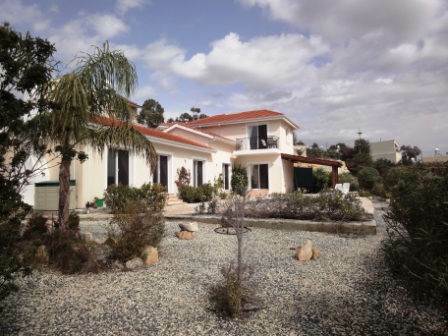 Nata, Paphos - This spacious detached villa is located in the unspoilt village of Nata, about 15 minutes from Paphos airport, 20 minutes from Paphos and 10 minutes from the sea. There is a village square with a community coffee shop that has some lively organised celebrations. The shops of Anarita and Timi are close by as well as three golf courses. The setting of this home is pure peace and tranquility with only sounds of the countryside. For those who prefer a quiet village life, and yet don’t want to be isolated in the middle of nowhere, this location is ideal. Steps lead down from the parking areas to the front entrance which opens in to a large foyer with the living accommodation to the right, and the bedrooms and staircase to the left. A hallway extending the length of the property has patio doors all along, providing lots of light and access to the pool terrace. At the end is a spacious living and dining room with feature stone fireplace, and again patio doors looking out to the pool terrace and stunning rural views beyond. Next along the hallway is a well equipped kitchen with breakfast bar, granite worktops, built-in oven, gas hob and stainless steel cooker hood. The washing machine and dryer is housed in a utility room next to the kitchen. There are two double size bedrooms also on this level which share a family bathroom. The larger of the two rooms has patio doors leading on to the pool terrace, and also fitted wardrobes. The upstairs accommodation is dedicated to the master suite, which includes a walk-in wardrobe and en-suite shower room. Patio doors open on to a balcony overlooking the swimming pool and from here you can see for miles. The countryside views, as from the ground level, are absolutely wonderful. Outside there is plenty of space for relaxing by the pool, and a wooden pergola provides a great place for outdoor dining. The gardens are designed with low maintenance in mind with graveled areas and automatic irrigation.